To achieve a home security that can be considered complete, homeowners will have to rely on more than just the best front door locks that they have installed. Security is all about layers, and these layers often consist of active and passive security deterrents. Your door locks are a prime example of active security deterrents, and this is why it is usually important to figure out how much force your deadbolts can withstand. The Netgear Arlo Pro 2 is the best outdoor security camera that homeowners can get their hands on. The similarities between this and it’s runner-up, the Nest Cam Outdoor, are uncanny. However, in some of the categories where it counts the most, the Netgear Arlo Pro 2 excels far ahead of the competition. 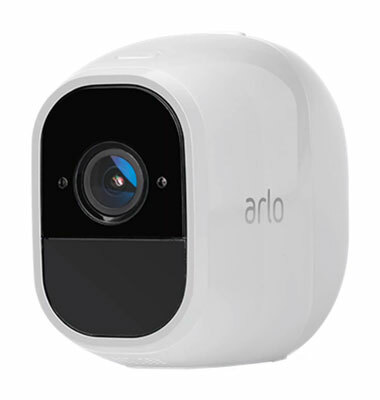 In regard to focus range and video resolution, the Arlo Pro 2 has a 130-degree viewing angle that is coupled with crisp 1080p HD video quality. This means that there is very little that your camera will not be able to capture. In addition to the visual aspect of the camera, it is built in a sturdy fashion that makes it a challenging foe to the natural elements it will have to contend with. The camera boasts an operating temperature that ranges between -4 degrees Fahrenheit to 113 degrees Fahrenheit, which equates to between -20 degrees Celsius to 45 degrees Celsius. Essentially, it is well equipped to withstand harsh temperatures. However, this is one of the few areas where the Nest Cam outdoors beats the Netgear Arlo Pro 2. When it comes to the storage of footage, this camera gives homeowners multiple options that they can take advantage of. First, the Arlo Pro 2 allows for local storage via a USB connection. This allows homeowners to connect USB devices or cards to the camera and store camera footage. In addition to this, the camera also allows for free cloud-based storage. The only caveat that comes with the cloud-based storage is that it only stores up to 7 days worth of footage. This amount of storage can be increased based on subscription services if need be. The Arlo Pro 2 is versatile, so it allows homeowners to decide if they want the camera plugged in or to be wireless. Thanks to its battery pack, the camera can run for an estimated 5 months before it requires a charging cycle. This gives homeowners the ability to place their cameras in multiple locations without having to worry about power cords, or whether or not their security will be down in the event of a power outage. In addition to some of the great features listed above, the Arlo Pro 2 also comes equipped with an audible smart security siren that acts as an additional security deterrent. 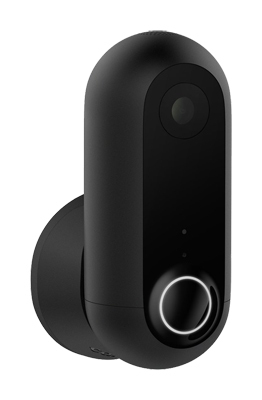 The camera also features motion and audio detection, as well as 2-way audio that allows you to listen and talk to anything in the area of where your camera is installed. At the price point of $456, the Arlo Pro 2 might seem steep, but considering the fact that you are getting a base station as well as 2 camera units, it seems like a fairly good deal. If you are familiar with the Nest brand of cameras, it might be because you came across them on our list of simple and easy to set up security cameras. 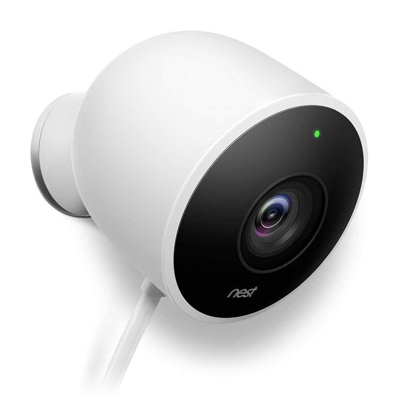 As any smart company would, Nest has diversified some of its products, which has led to the creation of the Nest Cam Outdoor, which is specifically geared towards outdoor use. In a nutshell, it carries has nearly the same features as the indoor Nest Cam, except now it has been outfitted with a protective covering that allows it to function best in the outdoors. With a 1080p HD video resolution and the mobility to be installed at just about any location on the exterior of your home, the Nest Cam outdoor is also one of the premier solutions for exterior surveillance. As was already mentioned, the casing of the camera itself has been improved so that it is able to withstand harsh climate changes. In terms of operability, the camera remains functional between -4 to 104 degrees Fahrenheit, which equates to -20 to 40 degrees Celsius. Essentially, this means that a really cold day or a really warm day will not deter the basic functions of your camera. Similar to its indoor counterpart, the Nest Cam Outdoor also offers night vision capabilities that allow you to record clear and crisp footage, no matter the time of day. In terms of a power source, the Nest Cam outdoor has to be plugged in, in order for it to function. The camera comes equipped with a 25-foot extension cord which homeowners can extend by connection to other power sources. The Nest Cam outdoor itself does not allow for continuous monitoring, although homeowners can upgrade their camera for this feature by means of a monthly subscription fee. Instead of continuous recording, video capture is triggered by motion and sound, and corresponding alerts are sent to homeowners via the cameras mobile application. The mobile application also allows the camera to be accessed from any location via Wi-fi. Overall, the Nest Cam is the best outdoor security camera, especially at the retail price of $149. At face value, it would seem that the cost of the Nest Cam makes it a better choice. However, if you are keen on being able to utilize storage space, as well as place your camera in more versatile locations, the Arlo Pro 2 would be a better choice. The main gripe that some users have with it is the lack of local storage. Though this is an issue, there are alternatives that can be explored, some of which include free 3-hour cloud storage that Nest offers, as well as their subscription-based cloud storage. The cloud storage subscription allows for either 10-day continuous recording package at the cost of $10 a month, or 30-day continuous recording package at the cost of $30 a month. The Logitech Circle, or the Logi Circle 2 as it is more commonly called, is an improvement upon the original Log Circle and is now equipped to work exceedingly well outdoors. 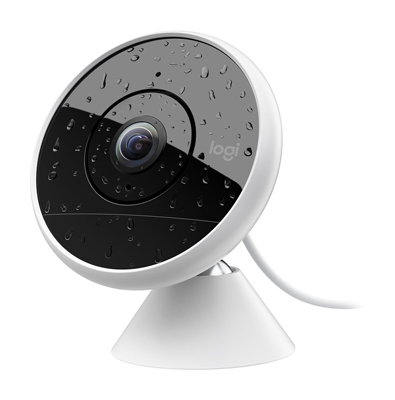 Similar to the two cameras that have already been discussed, the Logi Circle 2 is fairly easy to set up. It features 1080p high-definition video quality that ensures you will never miss anything that goes on around the exterior of your home. Unlike the reigning champion, the Netgear Arlo Pro 2, the Logi Circle is a camera that has to be plugged into a power source. This may not sound like much, but it is a feature that severely limits the versatility of the Logi Circle 2. There is a wireless model that can also be purchased, at an additional and higher cost. To help make the outdoor camera itself more versatile, Logitech also sells a weatherproof extension cable that helps you place the outdoor camera in more locations. In terms of video capability and quality, the Logitech holds its own against the top two contenders by also 1080p HD video, as well as a 180-degree viewing angle. The presence of two such features might usually make the Logi Circle 2 the best outdoor security camera, but it falls short because of its power source, limited cloud storage, and singular alert reporting. The Logi Circle 2 only offers alerts based on motion, whereas the two cameras discussed above offer alerts based on motion and audio. At the price point of $139, the Logi Circle 2 is extremely cost-effective, so for homeowners who hold cost above all the other factors that have to be considered, this outdoor security camera is a good choice for you and your family. It is especially good for families that are familiar with smart home devices and the interconnectivity they bring. The Logi Circle 2 is compatible with Amazon Alexa, Apple HomeKit, and the Google Home Assistant. This also means that it can be used flawlessly in conjunction with your smart locks and other home devices. Now for homeowners who are looking for a camera that offers a lot of features at an amazing price, then the Canary Flex should be one of the first options that you should consider. This does not, by any means, make it the best outdoor security camera, but it definitely makes it worth considering. With the current retail price of $137, the Canary Flex is one of the cheapest cameras on this list. Although this is a great price, there are some essential features that reflect its sales price. For instance, the Canary flex is limited to capturing 720p video footage over a 116-degree viewing area. This viewing area is much smaller than the ones afforded by the other cameras listed above, and although 720 pixels is not bad in terms of video quality, there is a higher chance that some images may be obscured. The Canary Flex is still equipped with night vision which means that regardless of the video quality, it will capture footage at any hour of the day, which is a good thing for many homeowners. The competition between the Canary Flex and the Logi Circle 2 was pretty close in fact, so depending on which considerations you value most as a homeowner, these two cameras may be interchangeable on this list. For the sake of this list, image quality and viewing angles were weighed much more than the power source, which is why the Logi Circle 2 is ranked higher than the Canary Flex. When it comes to its power source, the Canary Flex is similar to the Netgear Arlo 2, in the sense that it features a rechargeable battery and a power adapter that make it more dynamic in its placement. The Flir FX camera is a camera that boldly seeks to define versatility, and it was in very close competition with the Canary Flex. The main aspect that caused its downfall was simply that the camera itself was not built to be an outdoor camera. Instead, it has been retrofitted with a mount and a casing that makes it compatible with some exterior weather. However, it is faces operational challenges when exposed to some of the more harsh climates than its counterparts on this list can exist in. However, despite this glaring feature, the Flir FX is the only other camera on this list that provides nearly the same storage options as the Netgear Arlo Pro 2. This means that it allows for local storage as well as cloud-based storage. For homeowners that want to be able to store more footage and view it at will, this camera is a great deal. 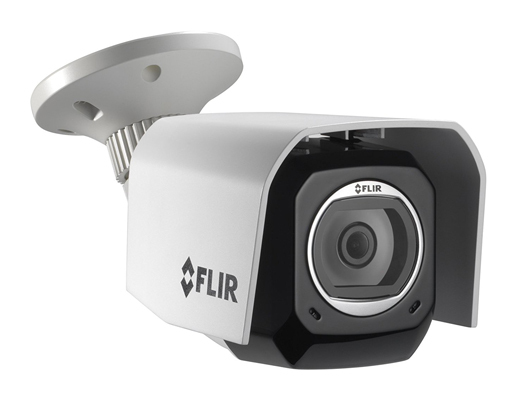 In regards to the quality of the footage that it records, the Flir FX, similar to the Canary Flex, also has a video output of 720p, coupled with a 160-degree viewing angle. The viewing angle actually exceeds that of the Canary Flex, but the price point and outdoor compatibility of the Flex push it over the edge as a superior outdoor camera. The Flir FX also features night vision mode which allows for round-the-clock recording. In addition to this, it allows for 2-way audio as well as motion and sound alerts. What makes outdoor cameras different than indoor cameras? Some homeowners might think that the easiest thing to do is to use their interior security cameras as their outdoor cameras. However, there are some glaring differences between interior and exterior cameras, and ignoring these differences will render your security cameras useless and ineffective. In comparison to indoor security cameras, outdoor security cameras have to weather the elements that are thrown against them. Many of these elements never directly affect the performance of an indoor security camera. In addition to this, outdoor security cameras are often used to cover a wider range of space than their indoor counterparts. Keeping these key differences in mind will inform some of the considerations that have to be made when you are selecting an outdoor security camera. There will be other considerations, as well but the image quality, focus range of the camera, and the way it operates in external conditions are of the utmost importance. Focus Range – The focus range of any outdoor security camera is an important consideration that has to be made whenever you are looking for the best outdoor security camera. Clarity in the footage is integral to your outdoor security camera, which is why the focus range of any outdoor camera is important. You want to select a camera that can adequately capture footage within a desirable range. Image and Video Resolution – Image and video resolution are the natural follow up to a cameras focus range. This is simply due to the fact that they each influence the clarity of the footage and images captured. When it comes to choosing an outdoor security camera, homeowners need to consider the resolution that the camera allows for. This is especially true for outdoor cameras that might be installed farther away from the ground. Weather Resistance – Unlike indoor security cameras, outdoor security cameras have to deal with natural outdoor elements on a daily basis. Which means that your cameras have to be built to cater to any such elements. Essentially, is your camera capable of continually providing crisp security footage in extreme temperatures or in the midst of a snowstorm? These are the kind of questions homeowners need to mull over. Night Vision – As you have probably noticed now, there is a lot of importance placed on the clarity that your outdoor security camera gives you, and for good reason. Without being able to capture clear footage at all times of the day, your security camera would be little more than an expensive decoration. This is why you have to consider whether or not the outdoor security camera you want to buy has night vision capabilities. Recording Storage – Camera footage has to be stored somewhere, which is why homeowners also have to pay close attention to the storage features that your outdoor security camera gives you. In this modern age, the options that are available are usually local storage (which is as a part of the camera itself) and subscription-based cloud storage. Homeowners will have to decide which storage options work best for their lifestyle as well as their security needs, and then consider how this affects their outdoor security camera choice. Power Supply – It goes without saying that an outdoor security camera will require some form of power supply. This may seem like something that doesn’t have to be considered but keep an open mind and you will see why this is even important. Outdoor security cameras can either be wired devices, or wireless devices. Devices that have interconnecting wires are often hooked directly into a power source, while wireless devices run on battery power that can either be replaced or recharged. Why is this an important consideration to make? Simply because your camera would not work without its power supply. Remote Access – Remote access simply refers to the ability of homeowners to control, and view, the footage of their outdoor security camera from a remote location. This is a feature that is present on many smart home devices, so homeowners who have used some of the best Bluetooth locks or the best keypad door locks will be very used to this particular feature. The benefits of remote access are rather simple. It gives you access to your camera and footage from any location. Cost – Now, the cost of your outdoor security camera is extremely important, and in many ways, it trumps most of the other considerations, because this is often the main deciding factor for homeowners who want an outdoor security camera. In general, security cameras have become more widely accessible, and they have also become easier to set up (a factor which influences the cost as well). These considerations are pretty much the tenets that will be used to select the cameras that will be listed below. This list has been compiled by paying close attention to the considerations and making a fair assessment of multiple security cameras. Choosing the right outdoor security camera can be a challenging task, and it is one that will require homeowners to calmly assess the state of their security. This should be done so that a camera that best suits your security needs is chosen. The 5 security cameras outlined above are the best outdoor security cameras on the market, in terms of their price, versatility, and the quality of the footage that they capture. Keep in mind that your considerations may be far different than the ones covered in this article. If this is the case, weigh all your options and choose a security camera that helps you adequately guard your perimeter.